A repository source is a description of a resource that can be used to access or store repository information. This class serves as a factory for RepositoryConnection instances and provides some basic configuration information. Typically this interface is implemented by classes that provide standard-style getters and setters for the various properties necessary for proper configuration via reflection or introspection. This interface expects nor defines any such properties, leaving that entirely to the implementation classes. Although any types can be used for these setters, other ModeShape components use reflection to set these properties and work best when the setters accept a single parameter that is a primitive, an array of primitives, a value compatible with PropertyType (e.g., Path, Name, URI, UUID, Reference, Binary, Long, Double, BigDecimal, DateTime, etc. ), or an array of values that are compatible with PropertyType. Implementations should also provide a no-arg constructor so that it is possible to easily create instances and initialize using the standard getters and setters. One example where this is required is when a RepositorySource instance is recorded in a repository (e.g., in a configuration area), and needs to be reinstantiated. If the connections created by a RepositorySource are expensive to create, then connection pooling is recommended. 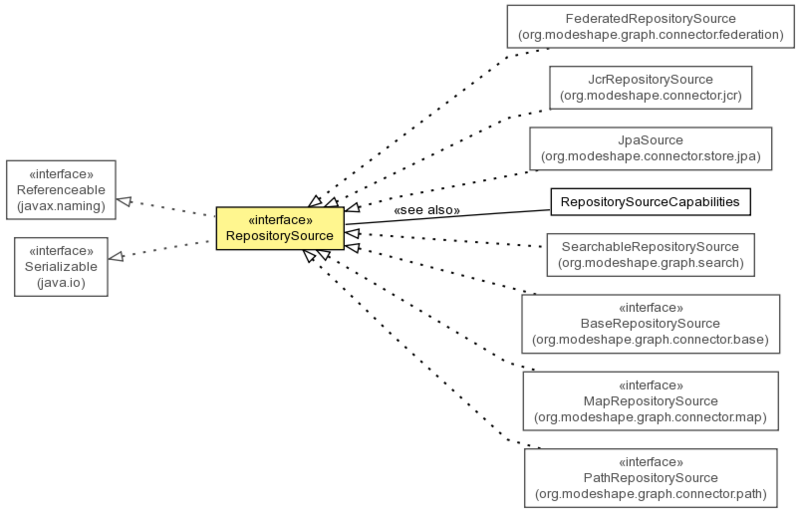 ModeShape provides this capability with a powerful and flexible RepositoryConnectionPool class. This is the pooling mechanism used by ModeShape, but you are free to use your own pools. Each connector is responsible for determining whether and how long ModeShape is to cache the content made available by the connector. This is referred to as the caching policy, and consists of a time to live value representing the number of milliseconds that a piece of data may be cached. After the TTL has passed, the information is no longer used. ModeShape allows a connector to use a flexible and powerful caching policy. First, each connection returns the default caching policy for all information returned by that connection. Often this policy can be configured via properties on the RepositorySource implementation. This is optional, meaning the connector can return null if it does not wish to have a default caching policy. Second, the connector is able to override its default caching policy on individual requests. Again, this is optional, meaning that a null caching policy on a request implies that the request has no overridden caching policy. Third, if the connector has no default caching policy and none is set on the individual requests, ModeShape uses whatever caching policy is set up for that component using the connector. For example, the federating connector allows a default caching policy to be specified, and this policy is used should the sources being federated not define their own caching policy. In summary, a connector has total control over whether and for how long the information it provides is cached. Sometimes it is necessary (or easier) for a RepositorySource implementation to look up an object in JNDI. One example of this is the JBoss Cache connector: while the connector can instantiate a new JBoss Cache instance, more interesting use cases involve JBoss Cache instances that are set up for clustering and replication, something that is generally difficult to configure in a single JavaBean. Therefore the JBossCacheSource has optional JavaBean properties that define how it is to look up a JBoss Cache instance in JNDI. Each RepositorySource implementation provides some hint as to its capabilities by returning a RepositorySourceCapabilities object. This class currently provides methods that say whether the connector supports updates, whether it supports same-name-siblings (SNS), and whether the connector supports listeners and events. These may be hard-coded values, or the capabilities object returned by the connector may determine them at runtime based upon the system its connecting to. For example, a connector may interrogate the underlying system to decide whether it can support updates. The only criteria is that the capabilities must remain constant throughout the lifetime of the RepositorySource instance (assuming it doesn't change). The RepositorySourceCapabilities can be used as is (the class is immutable), or it can be subclassed to provide more complex behavior. Why is this a concrete class and not an interface? By using a concrete class, connectors inherit the default behavior. If additional capabilities need to be added to the class in future releases, connectors may not have to override the defaults. This provides some insulation against future enhancements to the connector framework. The main method connectors have to process requests takes an ExecutionContext, which contains the JAAS security information of the subject performing the request. This means that the connector can use this to determine authentication and authorization information for each request. Sometimes that is not sufficient. For example, it may be that the connector needs its own authorization information so that it can establish a connection (even if user-level privileges still use the ExecutionContext provided with each request). In this case, the RepositorySource implementation will probably need JavaBean properties that represent the connector's authentication information. This may take the form of a username and password, or it may be properties that are used to delegate authentication to JAAS. Either way, just realize that it's perfectly acceptable for the connector to require its own security properties. Signal this source that it is no longer needed and should begin the process of reclaiming or closing all resources that it has acquired. Get the capabilities for this source. Get a connection from this source. Get the name for this repository source. Get the maximum number of retries that may be performed on a given operation when using connections created by this source. Initialize this source to use the supplied RepositoryContext, from which this source can obtain the configuration defining this source, connections to other sources, and the execution context. Set the maximum number of retries that may be performed on a given operation when using connections created by this source. This method may be called each time the configuration changes, allowing the source to update itself. Get a connection from this source. Even though each RepositorySource need not be thread safe, this method should be safe to be called concurrently by multiple threads. Get the maximum number of retries that may be performed on a given operation when using connections created by this source. This value does not constitute a minimum number of retries; in fact, the connection user is not required to retry any operations. Set the maximum number of retries that may be performed on a given operation when using connections created by this source. This value does not constitute a minimum number of retries; in fact, the connection user is not required to retry any operations. Signal this source that it is no longer needed and should begin the process of reclaiming or closing all resources that it has acquired. Because connections may still be in use, this method may not necessarily close all resources immediately. This is a required method, and must be called when this source is no longer needed if one or more connections have been obtained since the previous call to this method. Note that calling this method also does not preclude obtaining more connections after this method is called. If that happens, this source should simply reacquire any resources necessary to provide additional connections, and this method needs to be called once again. Copyright © 2008-2010 JBoss, a division of Red Hat. All Rights Reserved.